Ah, 2007. A new year, thank goodness. Old and busted: drama and trauma; new hotness: health, happiness, good food, friends and um...more hotness! Yay! 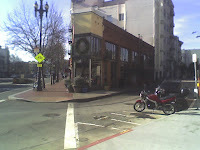 Because I booked our hotel near Union Square on Market Street, I already planned to make a trip to the much loved institution, the Zuni Cafe, also located on Market Street, a fifteen minute cab ride from the bustling crowds of downtown. The chef, Judy Rodgers, was a protege of Alice Waters of Chez Panisse fame, and has developed her own legion of fans by bringing her unique techniques learned under apprenticeship in France and applying them to the goodies the Bay Area has to offer. 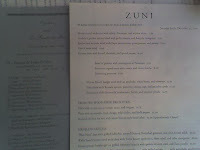 I've been cooking out of her cookbook, The Zuni Cafe cookbook (cleverly named) for years. Simple, clean techniques delivering rich and textured flavors. Fabulous. I'm a huge fan of how she dry-brines meats, which make an amazing difference in both taste and texture. Her standing pork roast was the star at one of my dinner parties. The restaurant is in a quirkily-shaped building, declaring its unique character upfront. 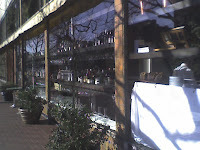 The windows are sparkling and full of beautiful glassware and libations. We had a reservation for 11:30 when they opened, and within minutes taxis dumped several parties of foodie fans onto the sidewalk and up to Zuni's doors, where the friendly staff was at the ready! Our server, Ted, was professional, friendly and knowledgeable. He and the mom unit immediately connected and were off and giggling within minutes. I had begged my mom to let me order for her their signature roasted chicken and bread salad that is made in their wood-burning oven since it was an FAQ triple whammy: I'm allergic to chicken, bread and lettuce! Alas, you could only order it for two people, plus it took an hour to custom make each order. *sigh*. So Mom settled for pizza margherita, and I ordered the hanger steak with white beans and a type of chimmichuri sauce. 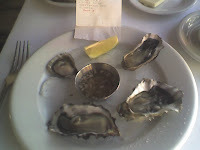 However, to start, I was going to take full advantage of their wares and with our server's help, selected some gorgeous ice-cold oysters to enjoy on the half shell. I prefer briny and creamy varieties of oysters...the metallic ones just leave me cold. ar ar. When choosing oysters, I always think of some critic who wrote that a particular type of oyster was "reminiscent of pocket change." So funny. The oysters arrived, neatly arranged, and our server brought the names of the oysters for me, organized "clockwise from the lemon". For some reason that just tickled me. The aptly-named Sweetwater was my fave, which turned out to be a local SF variety. Mind-blowingly fresh, it tasted like seawater gently trickling down my throat. The hanger steak was luscious and tender, and the sauce (which I had requested on the side because I was wary of how much garlic was pumped into it) was light and added a little more depth to the tastes and textures of this dish. It was good, but the portion was a bit tiny. 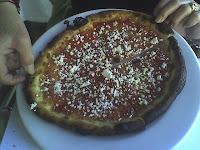 However, Mom's pizza was a delight! Simple and clean, and the woodfire oven baked crust just melted in your mouth. We were in shock and awe. In a good way. For dessert we elected to share the apple tart. 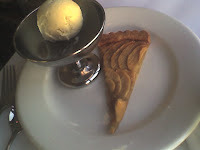 Normally apple tarts are benign, frail little delicate things. Not this puppy. The apples had an intense appleness (don't know what variety it was), were lightly sweetened, and the crust was basically a really dense shortbread. Light and delicious, it was a perfectly luscious ending served out with excellent coffee. Mom was fascinated by the brown ala perruche sugar cubes. Last but not least, let me take a moment to give tribute to the bread. 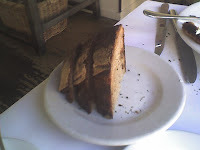 (BTW, I can usually manage to easily refrain from bread in restaurants since my wheat allergy is pretty harsh on me. But bread and butter is what I miss the most, and this was a special occasion and all, so I was willing to be sick later. Luckily, I am not a celiac so I can stray from time to time. However, to soften the blow to my system, when I'm about to be bad I always ensure that I have something else acceptable in my tummy first before my system goes to red alert. Okay, back to our regularly scheduled program.) From the artisinal Acme bakery, the bread was transcendent in every way. Beautiful to look at, a dark, substantial crust yielded to a light chewy sourdough middle at first bite, and our mouths gaped open at how good it was. Paired with the light sweet butter that tasted as if it was from cows milked that morning, I could have made a meal of just that. Mom agreed that it was amazing, and to prove it bought a loaf to take home with her. It went on the bus, to the hotel and on the plane. The whole thing was bigger than her head, and since she barely clears five feet, it made her waddle a bit when she tried to negotiate it down the street. But she never let go. What we do for love.